First of all, thank you all for your commiseration with me over my extreme dorkiness. 😳 I may eventually live it down. Or not. I can’t believe how many people raised their hand when Stephanie asked how many people blogged! I had no idea there were so many of us! It would be cool to do a little Portland Portland/tri-county/Vancouver/larger-metro-area/whatever Knitting Bloggers thingy. I’m touching bases with a few other bloggers whose emails and/or blog addresses I have to see if there’s any interest in getting something going. Did any of you knit in public on Saturday? I did. It was at my normal haunt — Tangle — but it was in public, even though it’s a yarn shop. And a couple of non-knitters did come in. I think. On Sunday I had lunch with my muggle friend M. She said, did you know today is National Knitting Day, or something like that? I gave her lots of credit for trying, because she was obviously paying attention! And told her that the day before had been Worldwide Knit In Public Day, and I did knit in public, which I do all the time anyway. On the more changes in PI subject, gentle reader, I’m pleased to announce the return of spell check on comments. Oh frabjous day! I think that’s the last thing lost during the WP 2.0 upgrade that had not been replaced or rewired or recoded or updated. Whew. It’s a really cool spell checker, too. Better than the old one. I think you’ll like it. 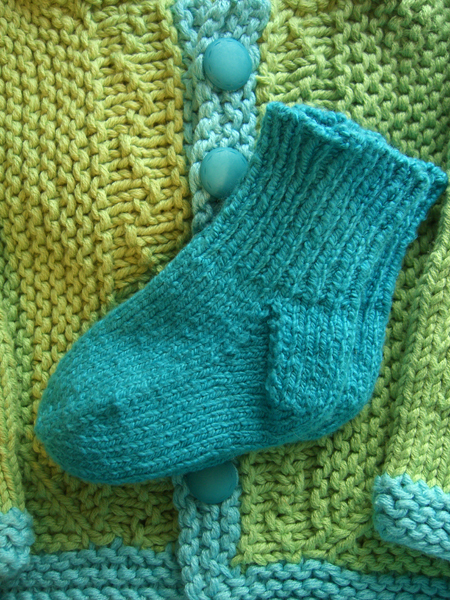 Here are the little blue baby socks. The knitting was finished at the Harlot’s book signing, and I did the bind-off when I got home. I think they came out really cute. I’m so pleased that I had some Cascade Fixation in a color that worked so well with the little sweater. I also have some Fixation in a lime green, but I think it may be too green. There really are two socks in this picture. Yarn: Cascade Fixation — 98.3% cotton / 1.7% elastic, 100g / 50 yds per ball — in an unknown colorway (might be 2706) — a tiny amount left over from a different project. Needles: Knit Picks Classics, US#2 (3mm). Pattern: my own standard toe-up sock pattern, just knit really, really small. Magic cast-on. Flap-and-gusset heel. Tubular bind-off. Next up: finishing the Spanish Lavender Basket Wave socks, another stab at Clapotis #2, Sockapalooza socks – hopefully the yarn will arrive!